Click here for Dr. Depue's NILCAMP lab website. 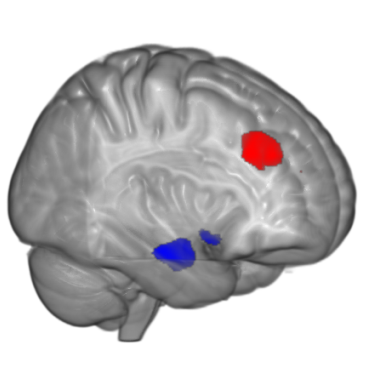 Functional magnetic resonance imaging or functional MRI (fMRI) is a functional neuroimaging procedure using MRI technology that measures brain activity by detecting associated changes in blood flow (red and blue in picture to the left). This technique relies on the fact that cerebral blood flow and neuronal activation are coupled. When an area of the brain is in use, blood flow to that region also increases. UofL has a Siemens 3 Tesla MRI available for research. MRI equipment is located in the HSC Instructional Building on the Health Sciences campus. Studies are run in collaboration with the Department of Radiology, and MRI resources are directed by Dr. Kwan-Jin Jung. Dr. Jung joined UofL after being the Technical Director of the Brain Imaging Center at Carnegie Mellon University. Click here for more information on the fMRI facilities. 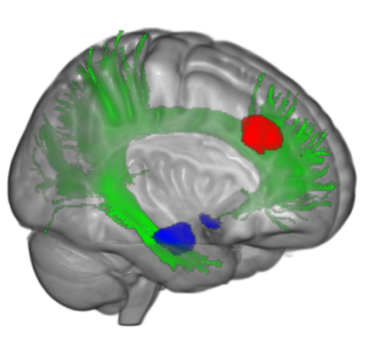 Diffusion tensor imaging (DTI) is a magnetic resonance imaging technique that enables the measurement of the restricted diffusion of water in tissue in order to produce neural tract images instead of using this data solely for the purpose of assigning contrast or colors to pixels in a cross sectional image (green in picture to the left). Using DTI enables researchers to infer certain characteristics of neural tracts, such as integrity. Voxel-based morphometry (VBM)and surface-based morphometry (SBM) are neuroimaging analysis techniques that allows investigation of focal differences in brain anatomy. 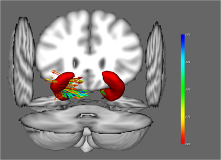 During VBM, volume of the whole brain or its subparts is measured by analyzing regions of interest (ROIs) on images from brain scanning and calculating the volume enclosed. During SBM the boundary between different classes of tissue can be reconstructed as a surface on which morphometric analysis can proceed (e.g. 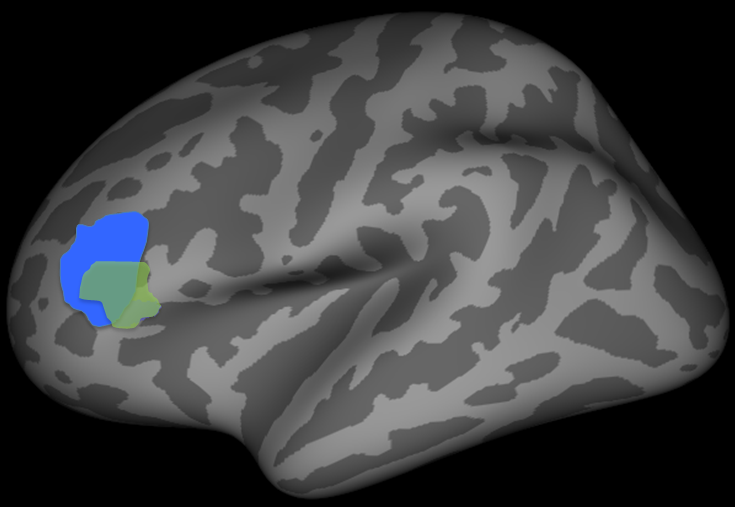 cortical thickness), or onto which results of such analyses can be projected. By combining fMRI, DTI and morphometry, researchers can understand how brain activity is related to the anatomical connections (neural tracts), volume and cortical thickness and how all of these are related to behavior.